Third Eye Blind is a rock band formed in the mid 1990s in San Francisco, California. 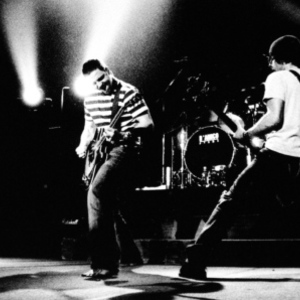 The original members were Stephan Jenkins (singer, songwriter, electric guitar), Kevin Cadogan (guitar), Adrian Burley (drums), and Jason Slater (bass guitar). The band's original line-up changed several times before the release of the group's debut album, and again shortly after the release of the band's second album Blue ? at which point the band's main guitarist Kevin Cadogan was released from the band under circumstances that still elicit controversy among fans. Third Eye Blind's current line-up is Stephan Jenkins (vocals, electric guitar), Abe Millett (bass guitar), Brad Hargreaves (drums), and Kryz Reid (electric guitar). More recently, bassist Arion Salazar has not been playing with the band, and his future as part of the quartet is unclear. Leo Kremer has been filling in for Salazar during concerts, but it is not yet known if he will become a full-time member. For a time the band also featured ex-Smash Mouth drummer Michael Urbano and early Primus drummer Tim ''Curveball'' Wright.